My husband and I recently went on a short trip – a babymoon, if you will – to Alaska. We were on the hunt for aurora. We chose a long weekend as close to a new moon and the equinox as our schedules would allow, two criteria we’d heard improve one’s chances of seeing the aurora borealis. Sadly, though we stayed up into the wee hours of the night with our camera at the ready, the weather and the aurora never cooperated. At one point we got tired of waiting and tried our hand at taking one of those star track photos, the ones where all of the stars spin around the north star. And, when we looked through the resulting photos, we found that maybe, just maybe, our camera was able to capture a hint of green aurora off to the north behind the trees. We were excited to realize it really was out there. But, it just wasn’t in the mood to be caught, I guess! 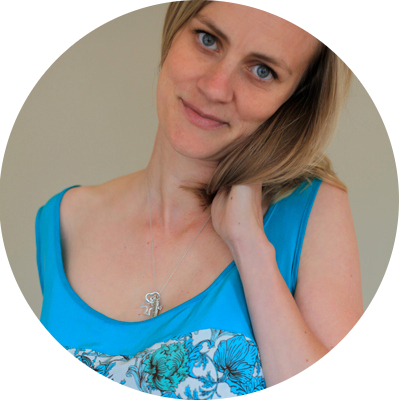 Okay, so what does all of this aurora talk have to do with sewing?! Before we left for the vacation, I got it into my head that I wanted to make an aurora dress in honor of the occasion. At that point though, it hadn’t quite sunk in that we might not see the aurora on our trip! 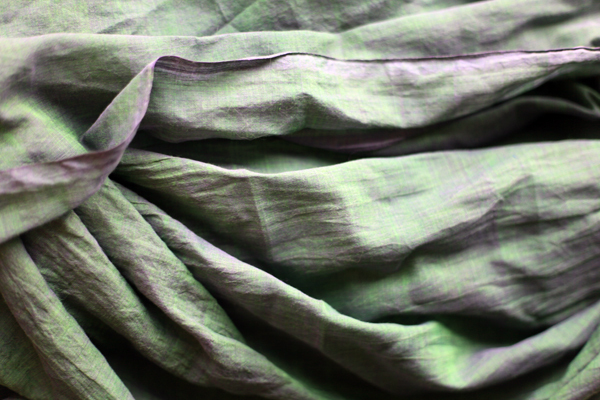 I’d found this radiant cotton voile at FineFabrics.com that was cross dyed emerald and purple. I loved that the two colors together shown just like I imagined the aurora would across the dark night sky. I’d even earmarked the Project Runway-inspired Simplicity 2145 as the pattern frontrunner since I thought that its empire waistline and full skirt – sans pleats, of course – would work for maternity, while I could easily come back in later and add the waistline details for a dress that would fit and flatter in the many more non-maternity years to come. Image adapted from Simplicity.com and FineFabrics.com. Of course, I didn’t have time to make the dress before our trip, which was probably a good thing since I would have been a wee bit chilly running around Alaska in a voile dress! So, I’m making it now, as a promise to myself and my husband that we’ll go aurora hunting some time again in the future. I’m starting with a muslin of Simplicity 2145, which means I don’t have anything to show for this project just yet. But, I couldn’t help but pause in my sewing to write a bit about the fabric. This voile is super interesting! 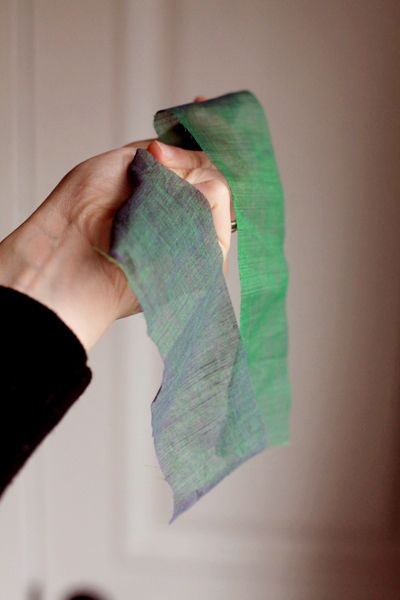 Untreated, it’s stiff and has a bright green cast to it that really catches the light. After pre-washing though, it softens up, and the purple threads come into their own and mix really nicely with the emerald, creating a darker yet more dynamic hue. The weave of the fabric even seems to get tighter after pre-washing. 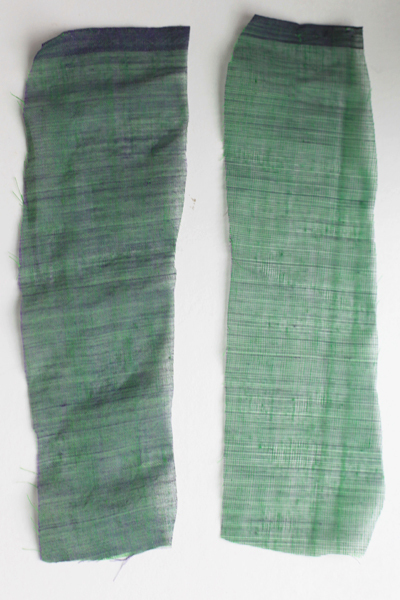 In the image below, the pre-washed fabric is on the left while the untreated fabric is on the right. Can you see the looser weave and brighter green on the right? It’s hard to capture on camera! How about now? What if I come a little closer? I think the color comes through a bit better than the difference in texture. 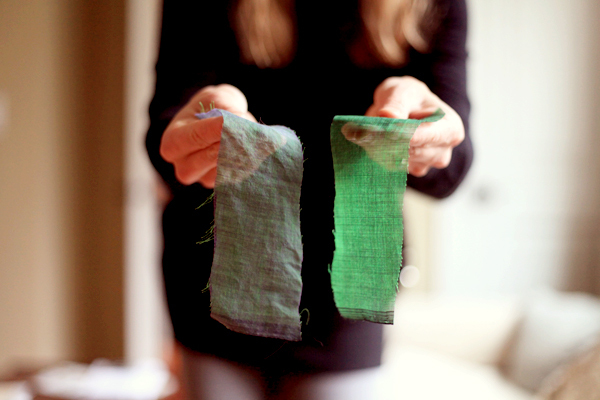 Again, the pre-washed fabric is on your left, and the untreated fabric is on your right. One last try to capture the difference in softness between the two. Maybe if I drape them over my hand? Maybe? No? You’ll just have to take my word on it then! UPDATE: I should also say that we had a wonderful time in Alaska, aurora or no! Wow,that is amazing how it changes. Just think how it will change as you wear it and the light reflects. Also, how lucky to go to Alaska, that is on my list for someday. I’m so glad you guys were able to take a little trip! Sounds pretty amazing, even if you weren’t able to spy the aurora borealis. This dress is going to be super cool! 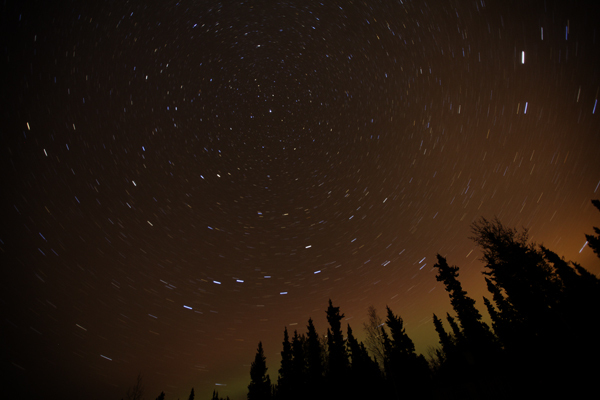 Wow, even though you didn’t see the aurora borealis, they pics of the Alaskan night sky are really gorgeous!! 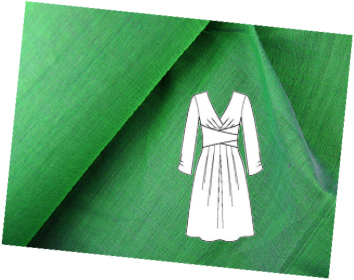 And, voile is a lovely type of fabric, so light and airy, yet not slippery or so thin that it’s too difficult to sew. I’m from Alaska (I’ve spent a LOT of time watching the lights, they’re one of the things that I miss the most), and the washed one reminds me more of the aurora, so yay you! The aurora can be super-vivid green like the unwashed sample. But the aurora plays with the darkness of the sky– it dances in and out of it, and they bleed together. So, yay washing 🙂 Anyway, I’m glad you didn’t try to get it done beforehand– you would have FROZEN, depending on where you went. Which part of AK did you visit? What an exquisite fabric – and I think you have chosen the perfect dress for it. I love the way it looks after being laundered, especially that it tones down the green and brings the purple threads to the foreground. I can hardly wait to see your finished dress and may have to borrow the idea and fabric (maybe in the blue and gray) for my upcoming 50th high school reunion. Love the star photo. Oh, Amy, what a great idea! Aurora hunting and a dress to commemorate it! One day you will take your little one with you to find an aurora and it will be ah-mazing! That is an amazing fabric! 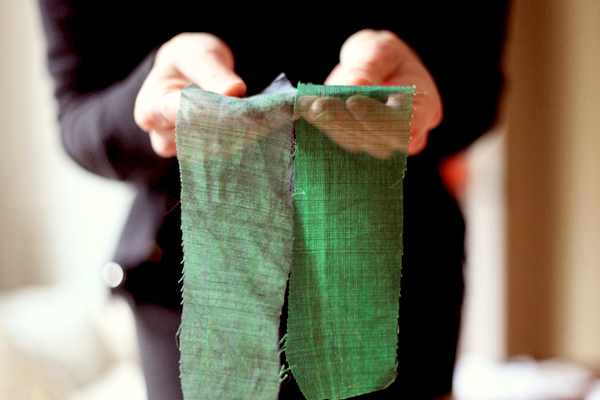 I definitely like the washed version best – can’t wait to see the finished garment! Oh, I’ve always wanted to see the aurora borealis! A few months ago there was a solar flare that was supposed to make the aurora visible in Illinois where I live. My husband I drove out to the middle of nowhere so we could see it better (you can’t see anything in the sky in Chicago except planes flying in! ), but we had no luck. It was really cloudy, and while our photos showed some spots of light, I think it’s only wishful thinking that could lead us to believe it was the aurora. Your star photo is absolutely gorgeous. It’s nice that you got to see a little aurora peeking out at the edges of the photo, at least! I’m also amazed by that fabric! Purple and green are my two favorite colors, so I might have to get some of this! Seeing the northern lights is something I would LOVE to see one day… so bummed it was a no show as I was reading through your post!! But… that voile is really quite something special. It’s cool how each photo captures something different about each piece… trying to capture all the facets of fabric really makes me appreciate how amazing our eyes really are! Sounds like a lovely pre-baby trip even if the aurora borealis was playing shy. Your fabric choice is beautiful and I’m looking forward to the reveal! My in-laws live in Alaska (Homer), and despite about 10 trips there, we’ve only seen the Northern Lights a handful of times (and always in the winter). Not much is better than sitting in a hot tub surrounded by snow and spotting the aurora! But even without them, though, Alaska is always pretty amazing! Can’t wait to see your finished dress! I think Nancy’s Sewing Basket in Seattle has a number of those voiles with different color ways, but sadly not on their website. Beautiful fabric! I can’t wait to see you make. Wow that is a beautiful fabric! Amazing what a difference pre washing makes. Curious to see the finished dress!